Loukoumades or Lokmades, as they are called in Cyprus, are Greek doughnuts. They take their name from the Arabic words “luqma(t) plural luqūm”, lokma and lokum or loukoumi, meaning morsel or mouthful. They are fried, shaped into small round ballls, served with honey, cinnamon and walnuts or plain in Cyprus dipped in sugar syrup. The doughnuts I tried in Greece are different from the ones we used to eat in Cyprus and at the beginning they did not thrill me, probably because I had only tried those they made at the panigyria (fairs). Thinking of this now, this was probably due to the fact that many batches were fried over and over again in the same oil and my guess is that the honey they used was probably imported, which was of inferior quality and much cheaper. When I tried the homemade ones, they were amazing! In Cyprus, it’s exactly the opposite. When we were kids our parents would take us to the panigyria in Cyprus and we loved Loukoumades and Shiamishi, which were by far better than the homemade ones. The ones sold at the fairs were the best and don’t ask me why. Before I made them I thought that the only difference between the Cypriot and the Greek ones was only a matter of the syrup used in Cyprus and the honey used in Greece. However, I was wrong! Last year when I made Akoumia they were really close to the ones we used to eat when we were kids. After making them I only realized that they had something in common and that was the starch they both had. When my sister visited me recently, I made Akoumia and she liked them very much.I told her how many attempts of making them failed and she asked me to tell her what ingredients I used.When I told her she revealed to me that the most important ingredients was missing. That ingredient was p……o!!! When I made her recipe they were perfect. Crunchy outside and soft and juicy inside just as I remember them like those we used to eat at the panigyria with Shiamishi. My sister’s recipe is included in my Cookbook Mint, Cinnamon & Blossom Water, Flavours of Cyprus, Kopiaste as well as in Volume 2 of my e-cookbook, sold on all Amazon stores. Much later, a friend of mine gave me the recipe and made the Greek Loukoumades myself. They did not remind me of the Cypriot ones but served with Greek honey and walnuts and cinnamon on top, made them really delicious. Loukoumades are Greek doughnuts. They take their name from the Arabic words "luqma(t) plural luqūm", lokma and loukumi, meaning morsel or mouthful. Dissolve the yeast with some lukewarm water, sugar and a couple tablespoons of flour. Cover and set aside until it bubbles. Put the remaining ingredients in a large bowl together with the starter. Add the remaining lukewarm water gradually, mixing with a whisk until you have a thick batter. Cover and set aside until it doubles in volume. Heat the olive oil in a small pot so that the oil is about 3 - 4 cm (1 1/2 inches). Place your left hand in the batter and trying to grab the batter with your fist. A small amount of batter will pop up between your thumb and forefinger. Use a teaspoon, dipped in oil, to take that amount and put it in the hot oil. Continue quickly until the pot is full, wetting the spoon in the oil, so that the dough does not stick to the spoon. When fried, the dough will double in size, so adjust the amount if you want to make smaller or bigger ones. Fry, mixing regularly with a slotted spoon, until golden on both sides. Remove on kitchen paper to absorb some oil (optional). Add lots of honey on top and sprinkle with some walnuts and cinnamon. If you have a thermometer, lukewarm water is around 40o C / 104 F. If not, try the traditional way by testing the water using you little finger. If you can stand the heat and count upto five, then the water temperature is fine. When I recently made some loukoumades, I kept some without adding any honey syrup. Instead, I made some mini sandwiches and served them with loquat jam and some Greek graviera. They are perfect for breakfast, brunch or just for a snack! No, this is not a tongue twister but I cannot find a more suitable word to describe these “loukoumades” (doughnuts) made with grape must (juice of fresh grapes), called “moustos” in Greek and banana! When we came to Athens, we brought with us some fresh grape juice, as my children wanted me to make some moustalevria for them. I bought some at the farmers’ market in Nafplio and kept it in the deep freezer. A few days ago, I had a dream or rather a nightmare, that I was making moustalevria but instead of it turning into a pudding it became like dough. I kept thinking of this dream and since then the idea of making moustoloukoumades was swirling in my head. Today, I made moustalevria and kept some grape juice to make loukoumades. The recipe is exactly the same as the above but instead of adding water, I added grape must. When I was about to fry them, I saw the bananas on the counter and decided to add some in the batter, so I cut two of them into 2 cm pieces and mixed them in the batter. 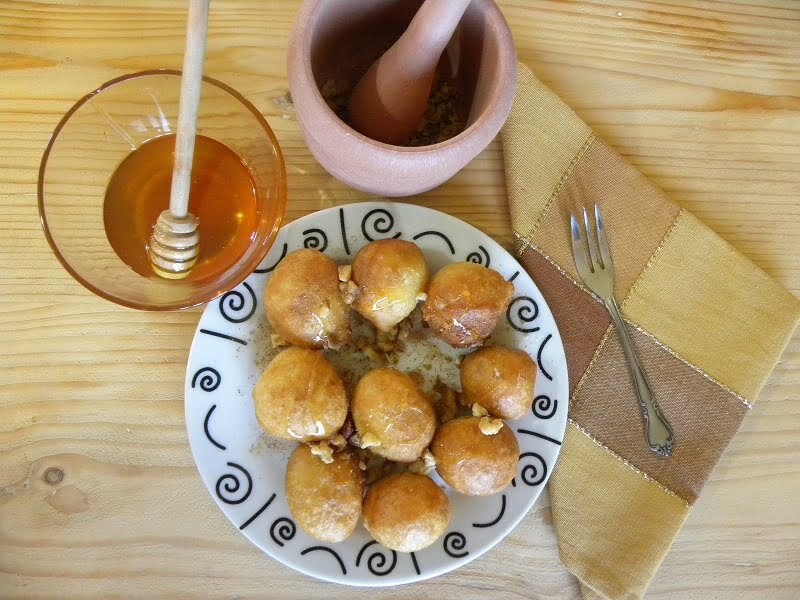 The grape must added a slightly sourish but aromatic taste to the dough and in combination with the banana inside and the toasted almonds and walnuts, honey and cinnamon on top, made them the best loukoumades ever! Instead of banana, I have also made them with apple slices and with chocolate. A few days I made some Lemon Curd, with our lemons. As wet had to consume it soon and I did not have much time to make another dessert to use it, I made some extra large loukoumades. I filled them with lemon curd and served them with kaimaki (Greek flavoured) ice cream, honey and walnuts mixed with cinnamon and sesame seeds. An easy, simple but delicious dessert! Now… your Loukoumades I havent’s taste from Cyprus. The first time I tasted it when I was in Athens. My Greek friend told me that the Loukoumades he bought was from a well known shop in Athens. The taste quite taken me aback because it’s very..I mean really, really sweet… 😀 This dessert also reminds me of my favourite – Gulab Jamun which is made from deep fried milk base dough in oil or clarified butter and dip in sugar syrup flavored with cardamom, rosewater or saffron. Sometimes, maple syrup is use as well. The idea of eating it with honey and jam is great! Definitely, I will try it when I can get some Orange Flower water! Will the taste differs if I omit the Orange Flower? Thank you for sharing the recipe and reminded me to return to Greece ASAP! Hi Pixen, thank you for visiting and I know which ones you friend was referring to but still I insist that they do not compare to the Akoumia or the Cypriot ones. I visited your site earlier and was impressed about your knowledge of mushrooms, however I was unable to leave a comment as I had to log in to leave an account. Another interesting post. I had no idea that the Cyprian loukoumades were so different. And using the p….o sounds interesting. Great and informative post Ivy! And I thought they were unusual because of the p…….o:-) Shall try them with cinnamon and sugar next time. You are right it must be the p…….o. I was lucky to win that lovely book. I forgot to blog about it. Hope to do so today. Must make some living as well girl, thanks to Ben. What a fabulous new treat Ivy; I so enjoy reading about your dishes, most I’ve yet to try for myself! So much work went into this one! Hola Ivy! Bravo for you and for not giving up at the third try! Thanks, this way we can all enjoy your loukoumades. @ Pixie: It wasn’t that difficult to make but I have the mess afterwards. @ Nuria: I must have made them more than three times. Thanks for visiting my blog. Sorry for the inconvenience. I already rectify the leaving your email thingy. It’s privacy of course 🙂 I may try to change to Blogger but not sure how… Will se about that later. Okay thanks for doing that. Ηi Ben and thanks for your help. I changed my blog to Blogger 😀 So, I think people wont have any trouble. I hope to get my own URL soon. It’s nice to have you back Swati. Pixen shall go and check again. Pixen, I’m back. It’s still the same. I have to get a WordPress Account in order to leave a message. These look delicious. I have fond memories of making doughnuts with my grandmother, but these sound even better! @ Lulu: Isn’t it nice to have such “sweet” memories either with your grandmother or your mother? @ Laurie: thanks for telling me about this but you see in Greek we say “friteza” which is not a Greek word. I could not find a translation for this word in a dictionary but I’ve seen the word fritters used for deep fried food so I thought it would be the noun used for the kitchen tool making fritters (lol). Well, having an untranslatable word is always a problem! 🙂 Maybe you could post a picture of it? Please?? Laurie, how silly of me, I forgot to mention that I found the word and corrected the post. I wanted to say deep fryer. These look so good Ivy. They always serve Loukmades at the Greek festival here, and it is delicious. Vani, p…..s are only used in the Cypriot loukoumades whereas in Symi, an island of Greece they use rice. In the rest of the country it’s just with the most simplest dough mixture of flour, yeast, water and a pinch of salt. Never thought of adding p…..o to the dough. I will definitely try them. Thank you Lisa. Hope you do! I can't find the recipe. Please help. I apologize John but the recipe has been removed as it is going to be published in my cookbook.I will send it to you by e-mail.